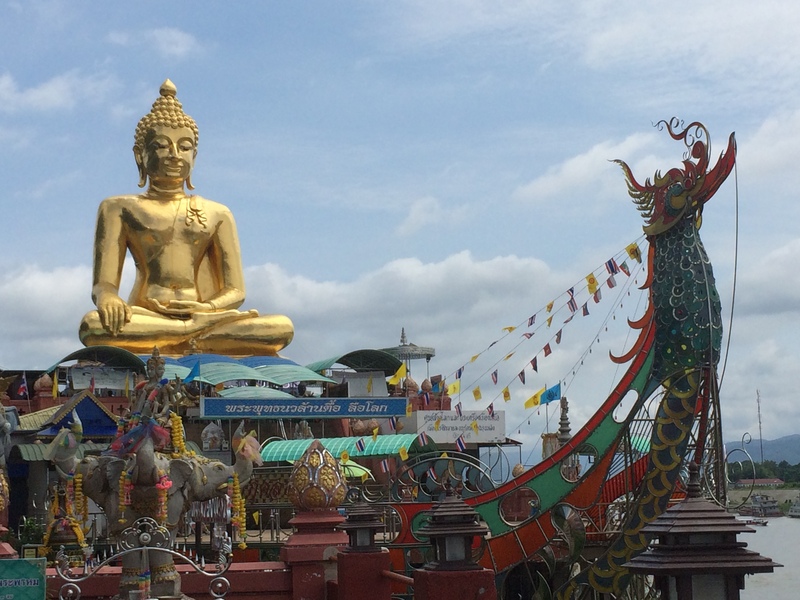 After leaving Sukhothai, we continued north – all the way to the Golden Triangle, the borders of Thailand, Laos and Myanmar (Burma). 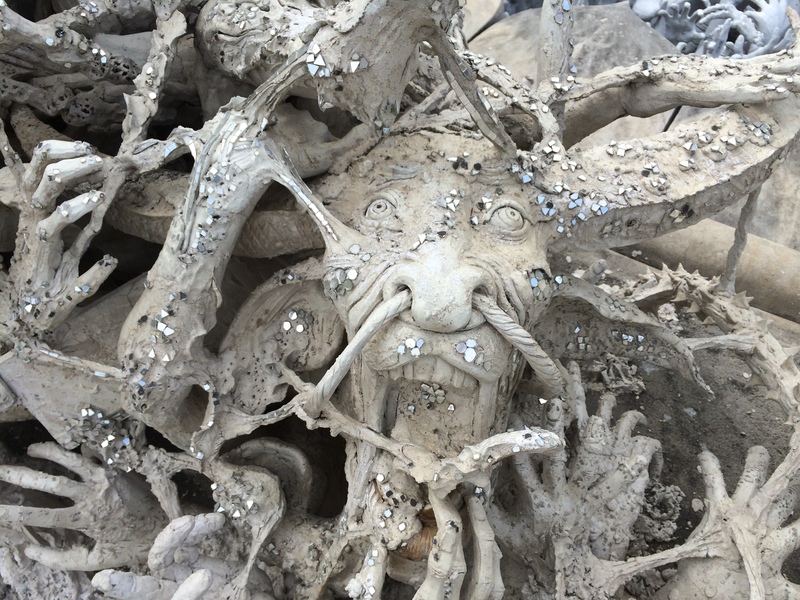 On the way we stopped at Wat Rong Khun, or the White Temple. 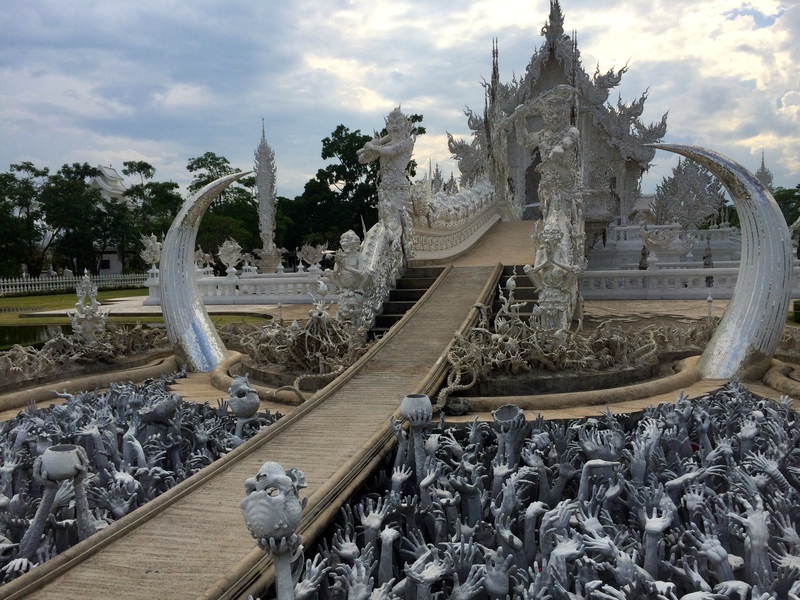 This temple is stunning, completely white and silver, and it is an ongoing project by artist Chalermchai Kositpipat. Unfortunately, we were unable to go inside the temple, as an earthquake had just hit the area and damaged the temple. You’ll see the broken steeple in the photos below. Luckily the damage was minor. Admission to the temple is free, or by donation – and there is also a museum/art gallery where the artist is frequently working. 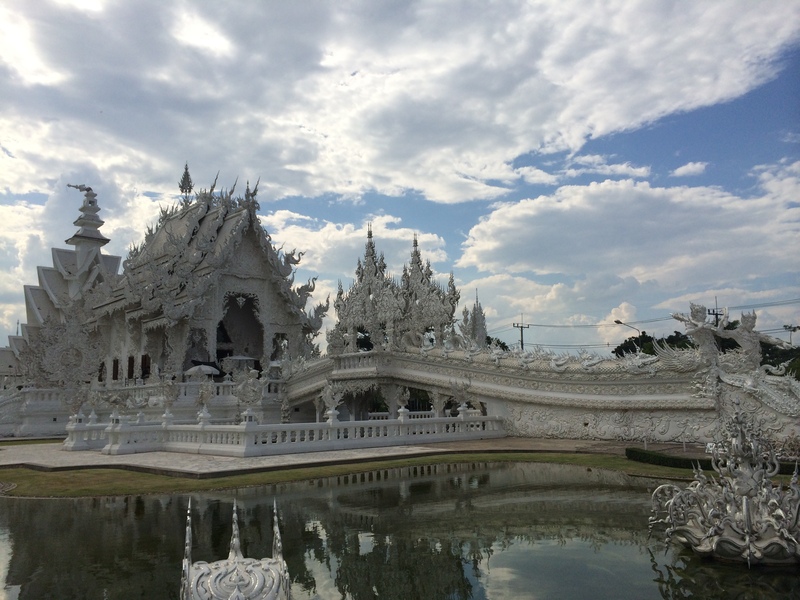 This was one of my favourite places to visit in Thailand. 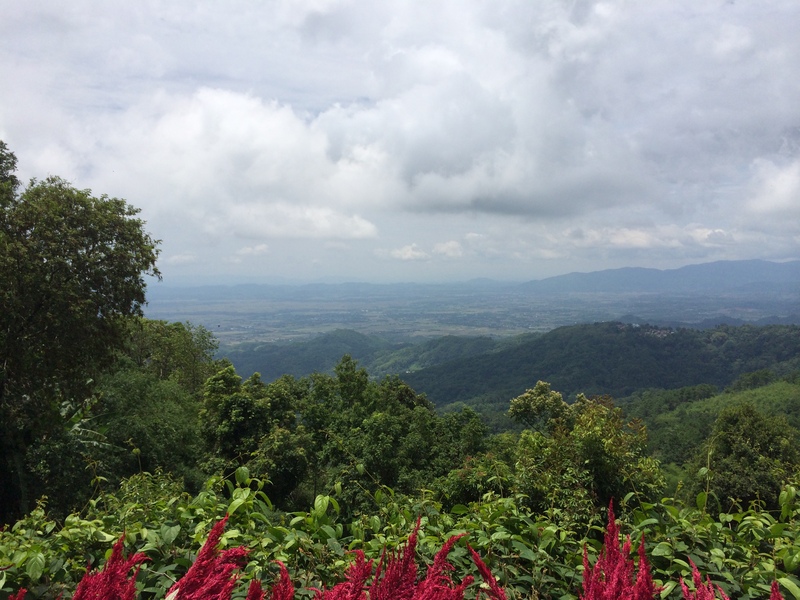 We continued to the Doi Tung region (6500 ft above sea level). Here the local hill tribes grow tea, coffee and macadamia nuts. 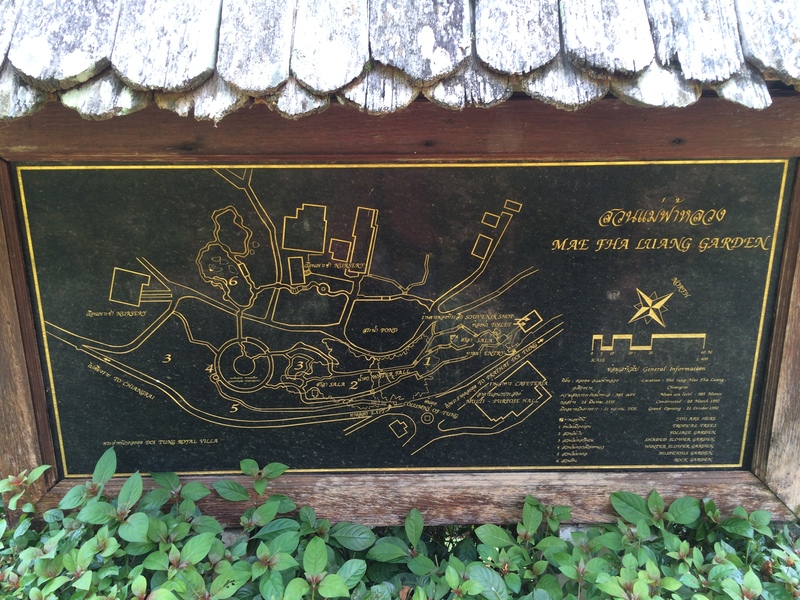 We toured the Doi Tung Royal Villa, which was built for the King’s Mother, also known as the Princess Mother. She helped transform the area from growing opium to the focusing on growing tea, coffee and macadamia nuts, as it is today. Near the villa are the Mae Fha Luang gardens, which are quite spectacular to visit as well. The temperature in this area is much cooler, especially compared to Bangkok! 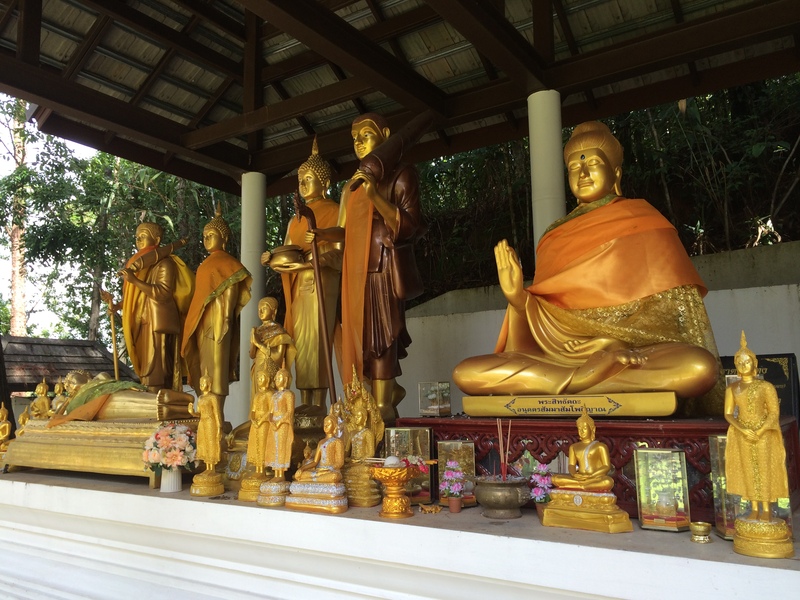 Nearby is Wat Phra That Doi Tung, a sacred hilltop shrine, regarded as the holiest sanctuary in the Chiang Rai area. Here I was able to receive a blessing from a monk. 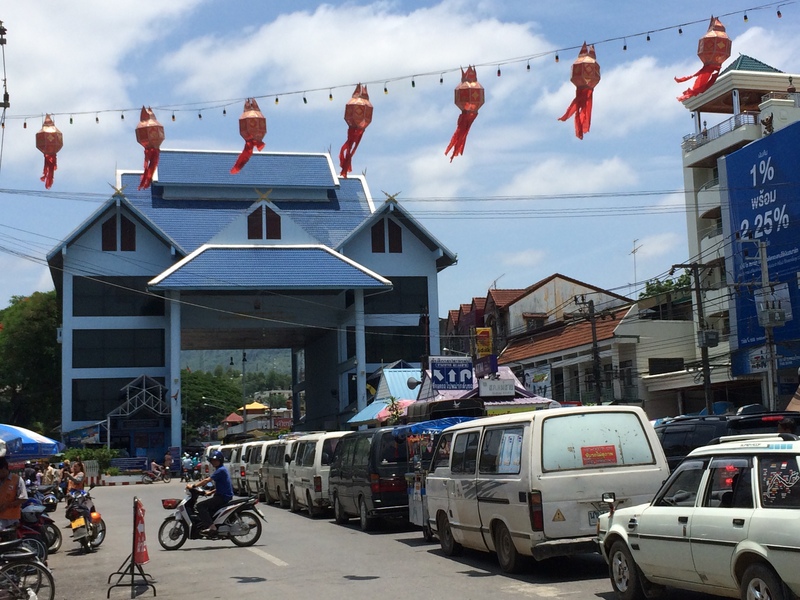 The town of Chiang Saen is right on the bank of the Mekong River, which is the border with Laos. 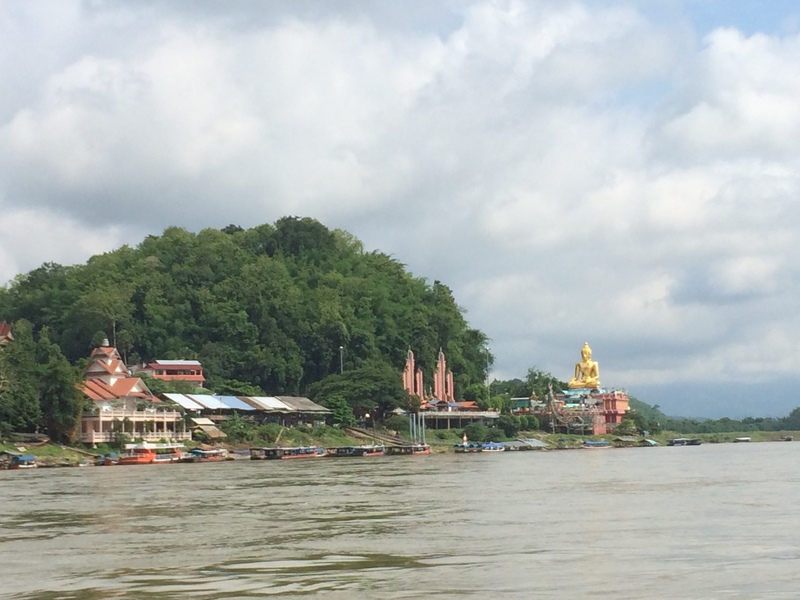 We traveled to the city to take a river cruise and make a quick stop at Don Sao, a small island which is a part of Laos. 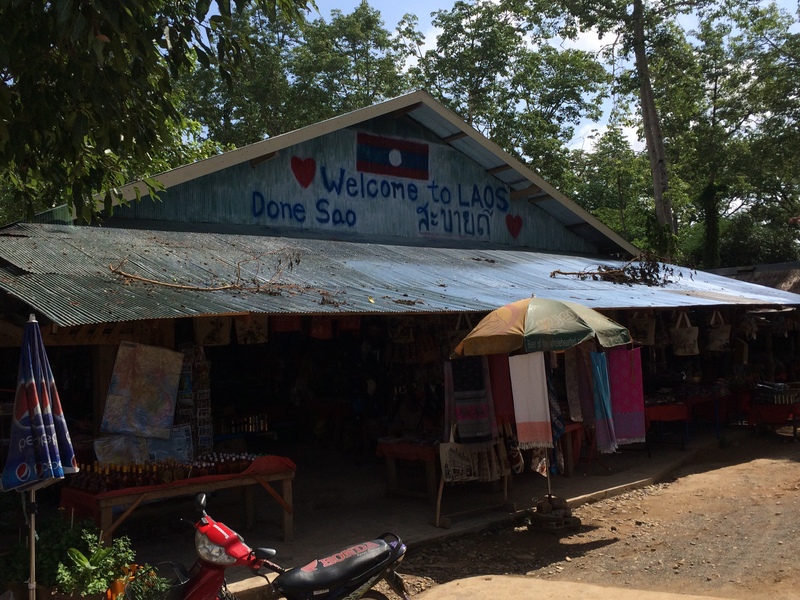 Don Sao is a bit of a tourist trap, with lots of souvenirs for sale – plus icecream, drinks etc. 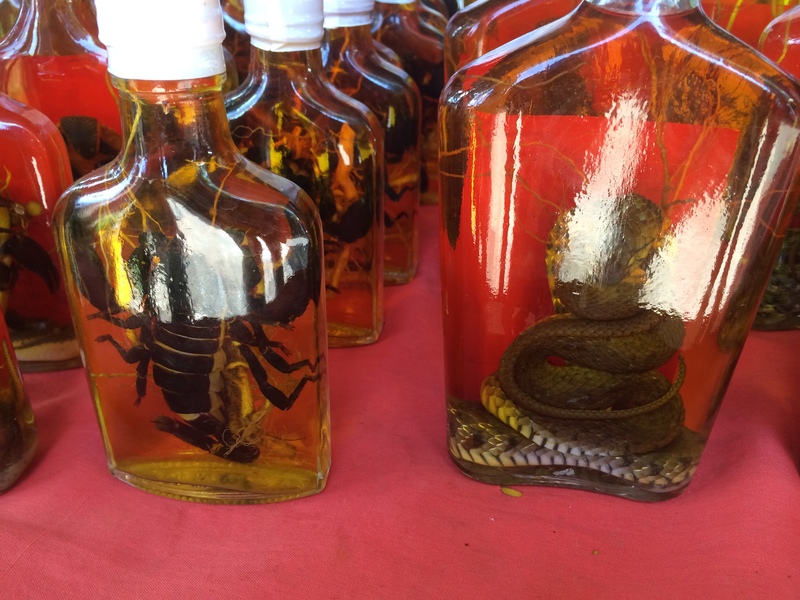 If it interests you, there are bottles of alcohol for sale, complete with scorpions or snakes inside! The last thing we did in this area was take a trip to Mae Sai, which is the border crossing with Myanmar (Burma). There isn’t too much to see there, aside from lots of traffic! 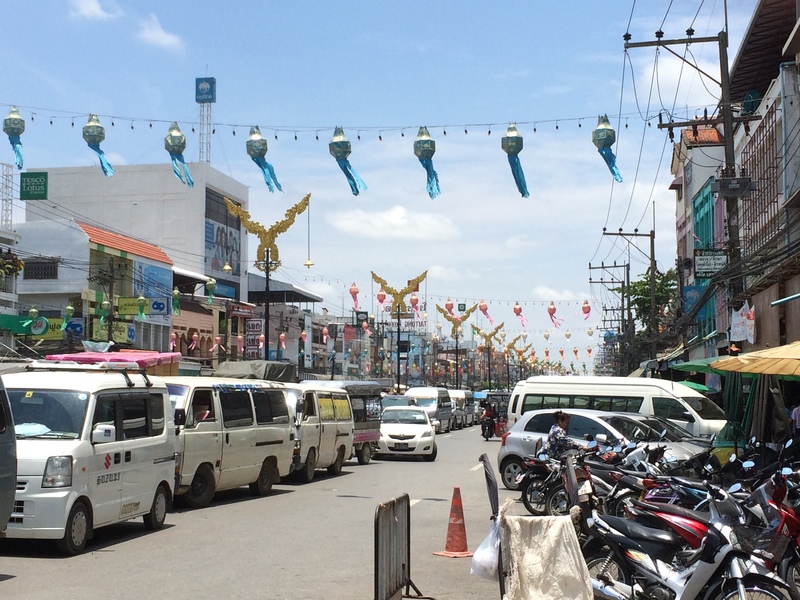 However, there are quite a few markets and some Burmese jewelry and handicrafts to look at. It was interesting to see the Burmese monks, as they wear maroon robes vs. the bright orange that the Thai monks wear. 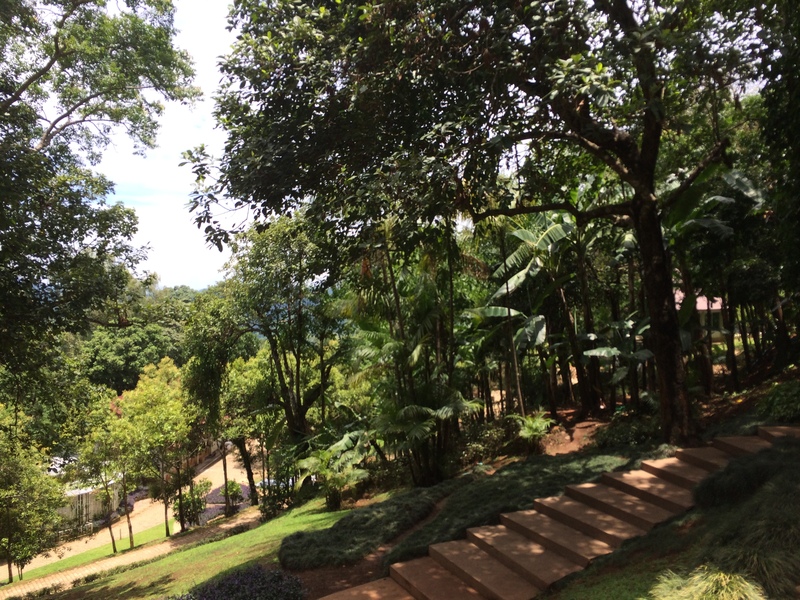 The next post will be about Chiang Mai, called “Rose of the North”.